The One Billion Dollar Question: Who Are the Libyan Rebels? | Democracy Now! professor at the School of Oriental and African Studies in London. He is author of several books, most recently, The Arabs and the Holocaust: The Arab-Israeli War of Narratives. He has published a long essay, “NATO’s 'Conspiracy' Against the Libyan Revolution,” on Jadaliyya.com. AMY GOODMAN: Libyan rebels have consolidated their grip on the capital of Tripoli by capturing Muammar Gaddafi’s main compound, a hugely symbolic victory that appears to put an end to his 42-year-long rule, but the whereabouts of Gaddafi remain unknown. He spoke Tuesday night on a poor phone connection to a Syrian-based television channel. MUAMMAR GADDAFI: [translated] All the tribes in Tripoli, out of Tripoli, youths, senior people, women, men and armed communities must attack Tripoli and comb the streets and eradicate the traitors and rats. They will slaughter you and desecrate your bodies. AMY GOODMAN: That was Muammar Gaddafi speaking from an undisclosed location on Tuesday. The Libyan leader said he had retreated from his Tripoli compound in a tactical move after NATO air strikes reduced it to rubble. In his address, Gaddafi vowed his forces would resist the aggression with all strength until either victory or death. Meanwhile, Libya’s U.N. envoy, Ibrahim Dabbashi, predicted Tuesday the country would be liberated within 72 hours. IBRAHIM DABBASHI: We expect Sirte, which is the natal city of Colonel Gaddafi, to fall in the hands of the freedom fighters within the next 48 hours. Our forces are coming from both sides, from the west starting from Misurata and also from the east starting from Ras Lanuf and Brega. They are moving now toward Sirte, and we expect them to capture Sirte very soon. 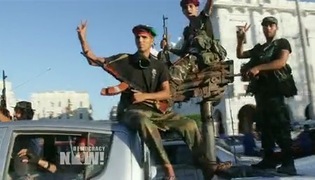 We expect also the population of Sirte to join the revolution soon. For Sabha, also we expect it also to join the revolution in the next 48 hours. So, we expect Libya to be totally liberated and totally calm and peaceful within the 72—the next 72 hours. AMY GOODMAN: That was Libya’s U.N. envoy Ibrahim Dabbashi. He had represented Gaddafi but was one of the first diplomats to defect. He said Gaddafi and other top officials may be scattered in houses across Tripoli or in an underground shelter. The Arab League said Tuesday it will meet this week to consider giving Libyan rebels the country’s seat at the League after it was taken away a few months ago from the Gaddafi government. [Corrected for accuracy] This is [Hamad bin Jassim bin Jaber al-Thani, Qatar’s prime minister and minister of foreign affairs], speaking at a meeting in Qatar, one of the main backers of the Libyan rebels. HAMAD BIN JASSIM BIN JABER AL-THANI: [translated] Libyan brothers who have died so far, what we hope for now is stability and consensus in Libya, and we also hope that wisdom, forgiveness and the rule of law will be adopted by all Libyans. One war is over, but the next has just begun, that of building and forging consensus amongst Libyans. And I think this is just as important as the previous war. AMY GOODMAN: That was [Hamad bin Jassim bin Jaber al-Thani, Qatar’s prime minister and minister of foreign affairs]. Today, Britain’s National Security Council is meeting to discuss welcoming the National Transitional Council. Talks have included how to send humanitarian aid and medical supplies. Ministers also discussed working with the U.N. to unfreeze Libyan assets to financially assist the council. For more, we’re going to go to London, where we’re joined by Gilbert Achcar, a professor at the School of Oriental and African Studies in London, author of a number of books, including The Arabs and the Holocaust: The Arab-Israeli War of Narratives. He published a long essay last week on NATO’s role in Libya. Welcome to Democracy Now!, Professor Achcar. Can you talk about what’s happening in Libya today? GILBERT ACHCAR: Hello, Amy. Good to talk to you. Well, what is happening now in Libya is what you described. I would say I don’t have more news than you do. But basically, the fight is going on until they can catch Gaddafi and subdue the remaining cities which are pro-Gaddafi or dominated by pro-Gaddafi forces. And as far as we know from the news, they are in intensive negotiations with people in these cities to do it peacefully. And we just heard also this spokesperson speaking of the rebels taking control in Sirte. So this remains to be seen. AMY GOODMAN: The piece you wrote is called “NATO’s 'Conspiracy' Against the Libyan Revolution.” Explain. GILBERT ACHCAR: Well, “conspiracy,” of course, is in quote marks, because I’m quoting in the article people who say that there is a conspiracy. But the key point is not a conspiracy. It’s a very open scheme that has been developing there from the beginning, actually, of NATO’s intervention. Ever since it appeared that it would be a longer perspective kind of intervention, schemes were designed actually to keep the situation, the war, going on, in some sense, not to precipitate its conclusion, while trying to get to some kind of agreement between the regime of Gaddafi and the rebels. And this has been until the very last period. A few weeks ago, the U.K.-led team of NATO, which designed a blueprint for Libya, was insisting on—you know, you have this kind of obsession about the Iraq example, where the Bush administration dismantled the Baathist state of Saddam Hussein when they invaded the country. And usually in Western sources, they attribute the big—the disaster that the invasion of Iraq turned into to this initial act. And therefore, the very obsession of NATO has been to avoid the same kind of situation in Libya and have a deal between the barons of the regime of Gaddafi and the rebellion. Until just a few days ago, the Financial Times editorial, for instance, was saying the rebels should not attack Tripoli. And, of course, the pretext given for that was that a bloodbath would occur. Of course, this hasn’t occurred, and fortunately. But this idea of not attacking Tripoli and trying to cut a deal with Tripoli has been all the time there. And the real stumbling block preventing this from happening has been the stubbornness of Gaddafi himself, because there was no way the rebels would accept a deal maintaining Gaddafi in any official position, and there was no way he would accept to step down. AMY GOODMAN: Who are the rebels, Gilbert Achcar? GILBERT ACHCAR: Who are the rebels? Well, this is actually the $1 billion question, actually, because even in NATO circles, you find the same questions. The fact is, of course, we know about the Transitional National Council, and even that is a limited knowledge because not all the members of this council are known, and there will be new members announced in order to represent the remaining areas, including Tripoli. And here you find a mixture of, you know, liberals and former regime members and traditional people representing tribal or original components of the country. What we can judge really is the program put forward by this council. In terms of a political program, what we have looks like a democratic blueprint for a democratic transition. They pledged to organize election, and actually two rounds of election: one for a constituent assembly, which would draft a constitution, and then a second round of election, based on the constitution, to elect a final government. And they pledged—and I’m really skeptical about it—but they pledged even that all the members of the existing National Council, the Traditional National Council, would not, I mean, enter in this electoral arena for the two rounds of election. Well, of course, this, again, remains to be seen. At the level of the economic program that is represented in the existing cabinet of the council, you find people who actually were already playing the same role under Gaddafi in supervising the neoliberal reforms in the country. So nothing much original, I think, to expect in that regard. I mean, this is not a socialist revolution. I don’t think anyone has ever had any kind of illusion about that. But this said, when we think of the rebels in terms of the fighting people, the fighting groups, when you think of the rebels in terms of the masses that have been—the insurgent masses that we have even seen in Tripoli on Sunday night coming out in huge numbers in what was formerly called the Green Square, which is the Martyrs’ Square, well, then you find, I mean, a completely heterogeneous landscape, and I would say the overwhelming majority of these people are people with no previous political background, and including those holding weapons now, because you have—I mean, most of the—on the rebel side, most of the people holding weapons were civilians before that. They were not military. And most of these people, you know, after 42 years of dictatorship, without any real, genuine political life in the country, are very difficult to describe politically. We will have to wait and see what will come out, when you will have a real political struggle starting in the country, in the same way that we have—we are witnessing a political struggle going on in Egypt or Tunisia, the two countries where the dictators have been toppled until now. AMY GOODMAN: How did NATO choose to work with this group of rebels rather than others? GILBERT ACHCAR: Well, I mean, you don’t—they didn’t have—you don’t have much choice. I mean, when the many countries in the world recognized the Transitional National Council, and you hear people saying, “Well, it’s not elected,” well, how could it be elected? It’s an insurrectional situation, and you deal with what you have. They didn’t claim to be the permanent rule of the country. They called themselves, from the start, interim or transitional. And they say that they will organize election and just leave the scene. And I just mentioned that they even say that all the members of their council would not even run in the two next—the next two rounds of election. So, I mean, there’s no alternative, I mean, to the Gaddafi rule for the time being in Libya but this council. Now, what will happen politically will—remains to be seen. Again, it’s like saying in Egypt, well, in Egypt Mubarak was toppled, but who took power? Who—I mean, the military. And actually, in that sense, what is happening now in Libya is a more radical transformation of the regime than what you had in Egypt, because in Egypt, basically, aside from the tip of the iceberg that was pushed aside, Mubarak and his cronies, basically the army is still in control, and it has been the backbone of the regime from the start, from the ’50s, whereas now, in Libya, although you have former members of the regime in the rebellions, in the rebellion, the structures of the regime, starting with the army, of course, of Gaddafi, which was rather a group of private militias and Praetorian guards and also including mercenaries, this is crumbling, this is collapsing. And we have seen how it has collapsed in Tripoli, even though it is not completely finished yet. AMY GOODMAN: Democracy Now! spoke to Phyllis Bennis yesterday, with the Institute for Policy Studies. She said control of oil in Libya by Western powers has been a crucial part of this conflict. PHYLLIS BENNIS: It’s not about access to the oil itself. That will be on a global market. It will be part of it. It’s about control. It’s about controlling the terms of those contracts. It’s about controlling amounts that are being pumped at different times. It’s about controlling prices. It’s about controlling that crucial resource. AMY GOODMAN: So we’re talking about many different oil companies—the French company Total, the U.S. companies Marathon and Hess, ConocoPhillips. There are many oil companies. And interestingly, Libyan rebel government said to Reuters in an interview that they would honor all the oil contracts granted during the Gaddafi regime, including Chinese companies. Gilbert Achcar, your response? GILBERT ACHCAR: Well, it’s absolutely obvious that oil is a key factor in NATO’s intervention, and had Libya not been an oil country, they wouldn’t have intervened. That’s absolutely obvious. Now, the issue here is, as you just mentioned, it’s not a matter of, you know, getting access to some territory which was beyond the Western access. All—basically all Western interests have been represented in Libya. All major Western oil companies have had contracts with the Libyan regime. And the government, the transitional government, Transitional National Council, is saying that they will honor these contracts with all—all countries. Well, that basically means that the gains, at this level, cannot be huge. Of course, if there are new concessions or contracts, those who will be privileged in getting the deals are the countries which supported the rebellion from the start, as the council said. But I think more important than that is the market to come, you know, because there has been a lot of destruction, and a lot of the infrastructure has to be rebuilt and all that. And of course, Western companies, starting with the American, British and French companies, will be very much interested in getting to this market. So, of course, NATO has a major incentive, and it’s a matter of interest, behind its intervention, and nothing else, basically. But between this and believing that NATO is now in control of Libya, there is, you know, a very far cry, because how can—I mean, even if you take countries like Iraq or Afghanistan with NATO troops on the ground, and massively in Iraq for a long while, they weren’t even able to control the country. So how do you want NATO or the West to control Libya by remote control, without any troops on the ground? And that’s why some people, like Richard Haass from Council on Foreign Relations, are now saying—you know, claiming—asking Washington to send boots on the ground. But this is something that has been adamantly rejected by the rebellion from day one. They asked for air cover. They asked for air protection. But they were adamant from the start at rejecting any form of intervention of troops on the ground. And they are still very much on this position. They have even made statements just recently that they would not allow NATO to establish any bases in their country. And we can see many signs, like, for instance, refusing to—saying that they would not hand over Gaddafi or his sons to the International Criminal Court, but through—I mean, to have trials in Libya itself. So, this shows the limitation, whatever they claim in Washington or London or Paris, the limitation of their real leverage over the Libyan situation. They had a leverage as long as—and they still have a more limited one—as long as Gaddafi’s forces are there and as long as the war is going on. But as soon as this will vanish, then the leverage that they will have will be extremely diminished. AMY GOODMAN: Gilbert Achcar, I want to thank you very much for being with us, professor at the School of Oriental and African Studies in London, author of a number of books, and most recently, The Arabs and the Holocaust: The Arab-Israeli War of Narratives, published a long essay this past week on NATO’s role in Libya.